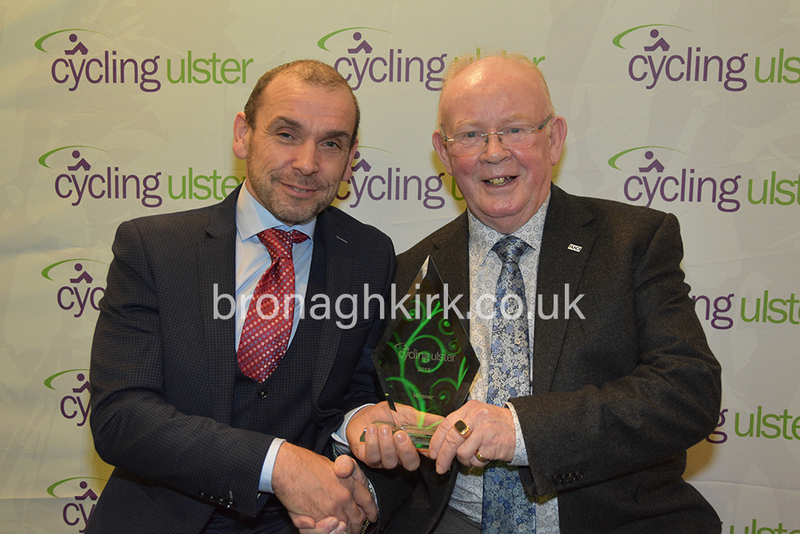 Photo - Tommy McKeague (R) (Cycling Ulster Chairman) presents the chairmans award to Jack Watson MBE. 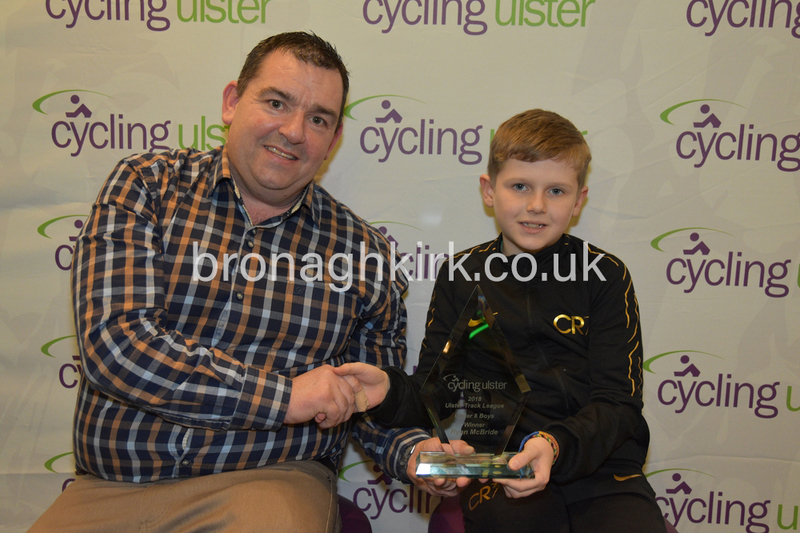 Cycling Ulster held their annual awards presentation in the Greenvale Hotel Cookstown on Sunday 27th January 2019. One hundred and sixty members and supporters enjoyed a superbly organised evening and a great meal served by staff of Greenvale hotel. Master of Ceremonies Martin Grimley assisted by Patrick Withers ensured that the many awards were presented in a very efficient manner. New chairman Tommy McKeague praised all of those who won awards but also said that all who took part at any level deserved great praise and encouragement. He presented a new 'Chairmans award' to Jack Watson MBE in recognition of his life time of service to cycling in Ireland as well as internationally. Among the guests, those who presented awards were President of Cycling Ireland Kieran McKenna, multiple TT Champion John Madden, representative of O'Reilly Stewart solicitors (sponsor of Cycling Ulster) as Cycling Ulster Chairman Tommy McKeague. List of award winners can be viewed on this page. Awards voted by Cycling Ulster members - Club of the year - Emyvale CC, Competitive event of the year - Foyle CC 3-Day, Leisure event of the year - Gabriel Bell Memorial Cycle Tour promoted by Emyvale CC, Volounteer of the year - Toby Watson VC Glendale, Bike Shop of the year - Bikehouse Bangor.